It all started with a dog named Truth. When the little wriggly ball of yellow fur stared straight into Scarlett Rigsby’s eyes, right after Rigsby prayed for clarity on which of the eight puppies to pick, it was the beginning of a nonprofit that would help thousands of children and their families. Rigsby had seen, from her 18 years working with the YMCA, how dogs can change someone’s day and was looking for a new ministry partner. Rigsby put down the puppy she had been holding and picked up HER puppy. 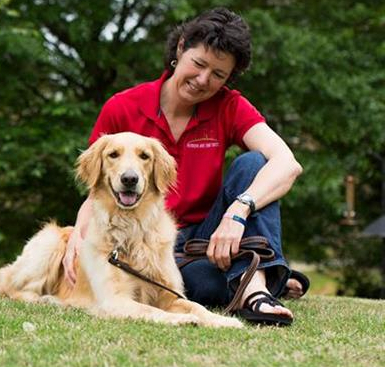 She named her new Golden Retriever “Truth” and took her faith and her dog and began meeting people where they were – serving them and helping change their lives. Out of that, Nothing but the Truth was born. Since that day in 2010, Nothing but the Truth has grown to serving over 1,000 Gwinnett and Clayton County public school students every week through their weekend food bag program, helping homeless families get back on their feet by providing Truth’s Home, offering medical and dental care at Truth’s Community Clinic, and providing homework help, ESL classes, and life conversation groups at Truth’s Place. Over the years, the Gwinnett Coalition for Health and Human Services has helped connect NBTT with resources, volunteers and more. “The Gwinnett Coalition’s Great Days of Service has helped raise awareness around what we are doing as they brought different groups to help and some of those people have started coming year round,” Rigsby said. “They also helped connect us with community partners who help pack and deliver our weekend food bags. “It’s an important project because once we can reduce absenteeism there is a better chance of success academically,” Rigsby said. For NBTT, the Swag Bag Project was a natural fit. “NBTT began with a desire to work in our schools and have them tell us what the community needs are so we could meet those. So when Suzy Bus, the Gwinnett Coalition’s helpline director and a long-time friend, asked us to manage the project, it made sense. We already had a relationship with school counselors and this would allow us to expand to communicating with the school nurses. “The Swag Bag Project has really exploded. 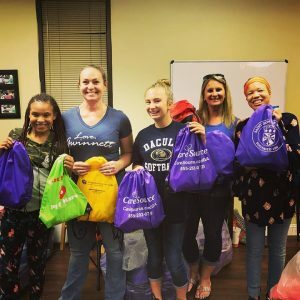 The Gwinnett Coalition piloted it in three schools and now we’re in 40 schools in Gwinnett and Barrow (and expanding to Clayton County) and have provided well over 800 bags, 800 pairs of underwear and multiple resupplies of pads just this school year. It’s still primarily in middle and high schools but we’re finding that some of the elementary schools are also asking for bags. Though the Gwinnett Coalition doesn’t manage the project, it still helps support it by sending any donations that could be used for the Swag Bag Project to NBTT and helping connect interested volunteers. As NBTT has experienced, being connected to the Gwinnett Coalition has helped expand their reach into the community. Their partnership highlights the Gwinnett Coalition’s mission of facilitating collaboration that improves the well-being of the community. 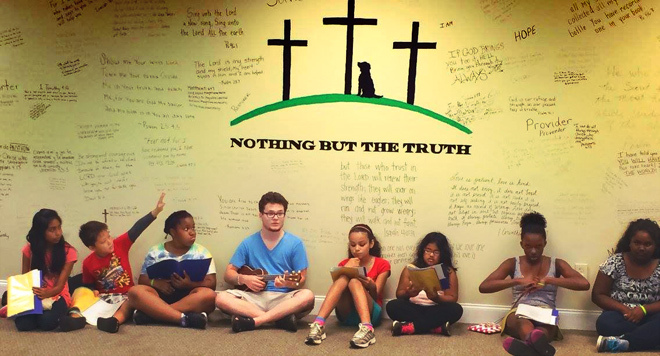 To discover more about NBTT and how you can get involved, visit nothingbutthetruth146.org. The Gwinnett Coalition for Health and Human Service is seeking a dynamic self-starter to assist in a wide variety of marketing and communications efforts to help the organization elevate brand awareness and increase visibility of its programs and services. The Marketing and Communications Intern will help to coordinate a broad scope of projects and deliverables encompassing various communication channels, including social media, print, digital media, media relations, and other outreach opportunities. He or she will work collaboratively with internal teams, as well as community volunteers and organizational stakeholders. A good fit for this position is someone who is proactive, organized, flexible, and passionate about social impact communications. The Gwinnett Coalition for Health and Human Services is a nonprofit organization dedicated to addressing the health and human service needs of all citizens in Gwinnett County, Georgia. As the official planner for health and human services for children and families, the Gwinnett Coalition strives to achieve its mission by identifying needs and resources, setting priorities, planning solutions, focusing on results, and educating and motivating the community to action. Developing systems for maintaining collateral inventory, marketing assets, and image library. Applicants should send letter of interest and current resume to Keith Fenton, Chief Operating Officer, at keith@gwinnettcoalition.org. Often times, parents asks their children, are you okay? A majority of the time, adolescents quickly respond, “I’m fine”. Yet, are they really? Like the nation as a whole, Gwinnett County has witnessed troubling growth in the number of teenagers struggling with symptoms of depression, anxiety, mood disorder or other mental health issues. The statistics are staggering! 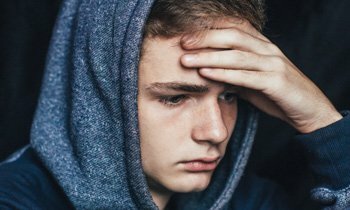 1 in 4 adolescents has, or will have experienced a mental health crisis, and the rate of teen depression is rapidly increasing. 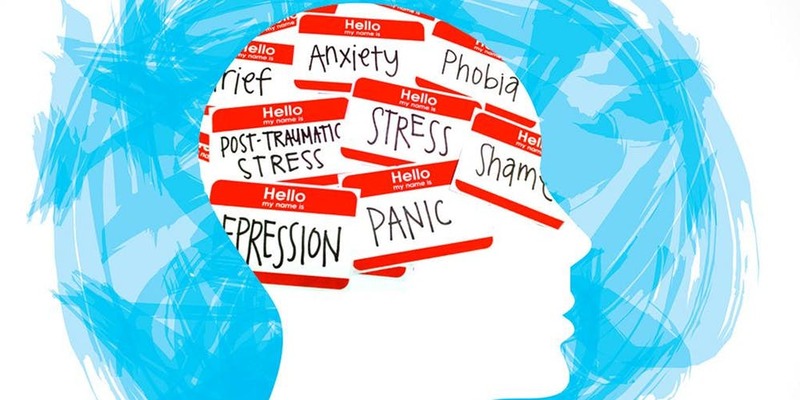 According to the National Institutes of Health, nearly a third of all teens ages 13 to 18 will experience an anxiety disorder during their lifetime, with the incidence among girls (38.0 percent) far outpacing that among boys (26.1 percent). In fact, suicide is the third leading cause of death amongst teenagers. Yet, approximately 30 percent of teenagers forgo needed care because they lack access to adequate insurance or mental health services. If left untreated, these issues can present as problems with school, friendships, substance abuse, reduced performance in school, and can lead to other negative outcomes. To help teenagers and their families better understand the social and emotional issues associated with anxiety and depression, the Gwinnett Coalition for Health and Human Services and its partnering organizations will present The Deception of Perception: A Mental Health Community Forum, on Saturday, May 23, 2019 at the Gwinnett County Division of Family and Children Services. Topics of the forum include anxiety, depression, bullying, sexual harassment, dating violence, setting boundaries, and more. Attendees will have an opportunity to participate in two panel sessions, two breakout sessions, and more than thirty vendors will be available to share information about the respective programs they offer. In addition, View Point Health will have a team of professional counselors on hand to assist any teenagers experiencing crisis or challenges. “Adolescents are under more pressure from parental, teacher and peer expectations than ever before. As a result, we are seeing a generation of kids who aren’t as resilient as they were 10 years ago,” says Keith Fenton, Chief Operating Officer for the Gwinnett Coalition for Health and Human Services. “We have noticed children and youth are experiencing difficulties managing daily stressors and struggling to use healthy coping strategies,” he says. Consequently, kids are more likely to turn to unhealthy coping strategies such as avoidance, substance use, self-injury and disordered eating. “It is vital to help the youth of today with anxiety and depression so that the adults of tomorrow are more equipped to cope and handle such challenges,” said Chad Jones with View Point Health. Promoting psychological well-being and protecting adolescents from adverse experiences and risk factors that may influence their potential to thrive are not only critical for their well-being during adolescence, but also for their physical and mental health in adulthood. For information about the mental health forum, call Program Specialist, Sarah Jane Baskin, at 770-995-3339. PRESENTED BY: The Gwinnett County Alumnae Chapter of Delta Sigma Theta Sorority, The Gwinnett Coalition’s Positive Youth and Family Development Committee, Gwinnett County Department of Family and Children Services and The Rho Kappa Lambda Chapter of Alpha Phi Alpha Inc.
Transportation comes in many forms and influences our lives in many ways. As the citizens of Gwinnett County begin to ponder how they will vote on the March 19th transit referendum, one aspect to consider is how transportation options can directly and indirectly affect the health and well-being of the community. Expanding the availability of, safety for, and access to a variety of transportation options has the potential to save lives by preventing chronic diseases, reducing and preventing motor-vehicle-related injury and deaths, improving environmental health, enhancing access to medical care and healthy food while stimulating economic development, and ensuring access for all people. 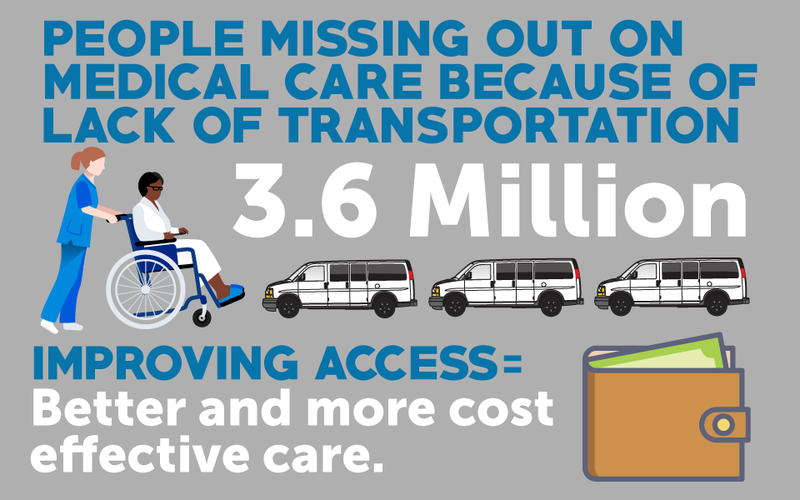 Studies show that lack of access to transportation reduces health care utilization among children, seniors, low-income people, and people with disabilities. One survey found that 4-percent of U.S. children (3.6 million in total) either missed a scheduled health care visit or did not schedule a visit during the preceding year because of transportation restrictions. While the majority of the population here in Gwinnett County has ready access to and typically use private automobiles to access health care and other community services, there also is a significant segment of the population that either does not have access to a personal automobile or is not currently capable of driving. This can limit their access to health care, but it has greater health implications because it can also limit access to nutrition and other community services, as well as involvement in social activities. Limiting this access deprives people of the opportunity to make the choices that allow them to live a long, healthy life, regardless of their age, income, education or ethnic background. Each day, until the March 19th transit referendum, the Gwinnett Coalition will share information through its social media outlets illustrating how public health improvements are among the largest benefits provided by high quality public transit. Prosperous communities, like Gwinnett County, often present the illusion that homelessness could not possibly exist. However, a closer look reveals a sobering reality. Homelessness in Gwinnett is real and it is here! How many people are currently homeless in Gwinnett County? How many of them are families, youth, seniors, or veterans? The answers to these questions may soon be answered as Gwinnett County prepares for the Point-In-Time (PIT) count on January 28 – January 31, 2019. 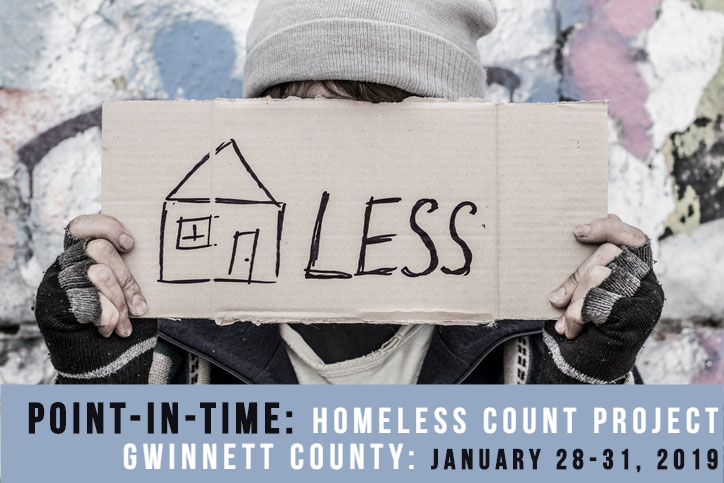 The PIT count aims to calculate the number of individuals and families experiencing homelessness on any given night in Gwinnett County. The count records the number of individuals staying in shelters and transitional housing and estimates the number of individuals who are unsheltered — sleeping outdoors, in parks, on the street, in vehicles, abandoned buildings, under bridges, and other places not meant for human habitation. The information learned from the count will provide us with a unique opportunity to understand not only the depth of Gwinnett’s homeless population, but also where they are located and what may have led them to becoming homeless. Ultimately, the count also provides an opportunity to plan services and programs to appropriately address local needs, measure progress in decreasing homelessness, and identify strengths and gaps in Gwinnett’s current homelessness assistance system. Homelessness is a complex social problem with a variety of underlying economic and social factors such as poverty, lack of affordable housing, uncertain physical and mental health, addictions, and community and family breakdown. These factors, in varying combinations, contribute to duration, frequency, and type of homelessness. To be fully homeless is to live without shelter; however, many experience partial homelessness that can include uncertain, temporary, or sub-standard shelter. He served his country and did three tours in Iraq. He experienced death, war and battle. He came home with an honorable discharge, post-traumatic stress disorder and few employment opportunities. One piece of bad luck followed another until he found himself sleeping in the alleyway of a shopping center. He just wants a job and the chance to get his life together again. She is a woman of a certain age, a homemaker married for 30 years before her husband left her. The last thing she would ever do is to become a burden to her grown children who live in different states. They think Mom is doing OK, but Mom is not OK. You see, she lost her house eight months ago and has been sleeping in a car every night since and visiting libraries in the daytime hours trying her best to blend in. Organizers from the Gwinnett Coalition for Health and Human Services, in partnership with United Way’s HomeFirst Initiative, Partnership Against Domestic Violence, and Obria Medical Clinics, are inviting government, non-profit and faith-based organizations, businesses, community and advocacy groups, and private citizens to help fill more than 700 volunteer positions needed to conduct the Point-In-Time count. Volunteers will work in teams to complete the visual count by visiting encampments, extended stay hotels, nonprofit service agencies, hospitals and clinics, and many other locations in every municipality in Gwinnett County, which is why volunteers are essential to conducting a robust and accurate count. Need Help? Know Someone Who Does? The Gwinnett Coalition for Health and Human Services is a public/private partnership whose mission is to facilitate collaboration that improves the well-being of the community. We accomplish this mission by identifying needs and resources, setting priorities, planning solutions, focusing on results and educating and motivating the community to action.